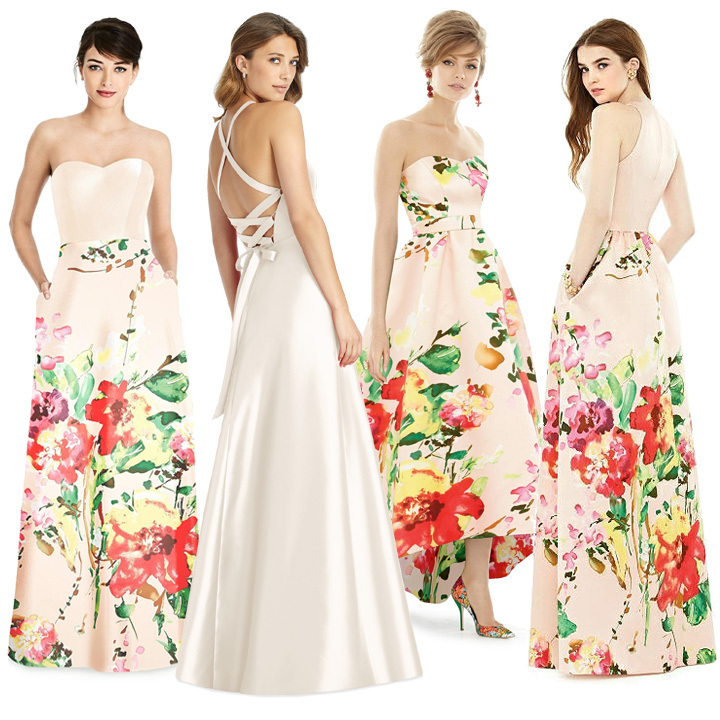 With spring just around the corner, now is the perfect time to start thinking about floral bridesmaid dresses. The beauty of this trend is that there are so many ways to make it unique and fresh for your spring or summer wedding. Assuming that you've already picked your wedding venue, you'll need to consider how your bridesmaid dresses and wedding color palette will fit into the décor. Some venues with existing décor may clash with your color palette and make your floral bridesmaid dresses look out of place. For example, an elegant ballroom venue with Gatsby-like décor isn't going to pair well with whimsical pink florals. If you haven't picked a venue yet and have your heart set on your maids wearing florals, try finding a wedding venue that is essentially a blank slate. 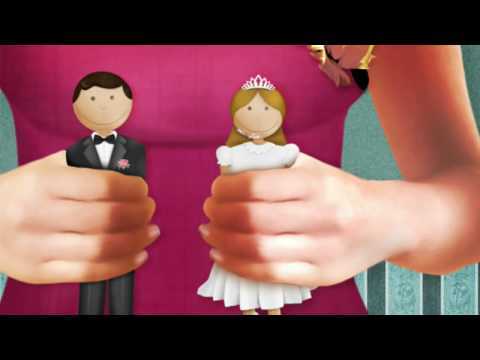 Flowers bloom in the spring, thus making them a natural fit for spring or summer weddings. We've even seen some brides get away with florals in early fall by opting for stunning bridesmaid dresses in plum or burgundy. If you're having a winter wedding, you'll want your wedding colors and flowers to go with the season. Although winter weddings traditionally call for cooler colors, you might be able to find a floral pattern that complements your seasonal hues. Opt for flower prints in darker colors, such as black or dark blue, for that winter style with a touch of light romance. 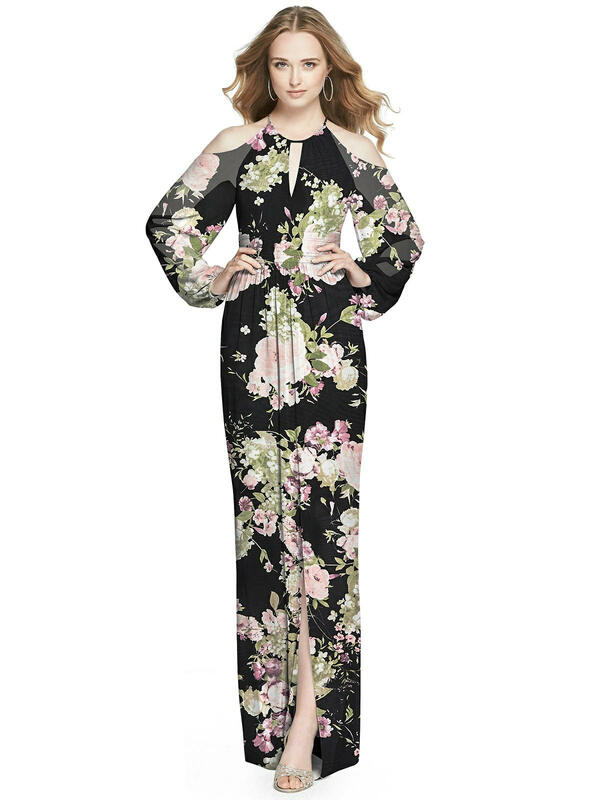 Florals are a flirty and romantic print that can have a bold visual impact. The key to effortlessly pulling them off with finesse and style is by not allowing them to appear overwhelming. One of the trendiest ways to avoid this is by having your maids wear mix and match bridesmaid dresses in various colors and prints. If you have a lilac color scheme, for example, you could have your maid of honor wear a floral bridesmaid dress to make her pop from the rest of your bridal party. You could also easily do it the other way around by having her wear a solid color and outfit the rest of your maids in florals. Creating balance and structure is key to nailing the floral bridesmaid dress trend. By mixing solids and florals, you'll instantly win style points for your bridal crew. Plus, it will please your maids by giving them options for choosing their dresses—a win-win! On a similar note, you may want to tone down your bridesmaids' bouquets if they're all wearing floral dresses. Big, eye-grabbing bouquets can be overkill when they're already wearing bold prints. A bouquet of baby's breath or some simple, white roses are sure bets because they work with any floral pattern, regardless of size. However, you can also get away with bold bouquets if your prints are on the smaller side. Think of it this way: You're saving money on floral bouquets by having your maids wear them instead. Not to mention that simple bouquets are easier to make if you're going the DIY route. As you can see, there are plenty of ways to get creative with florals. 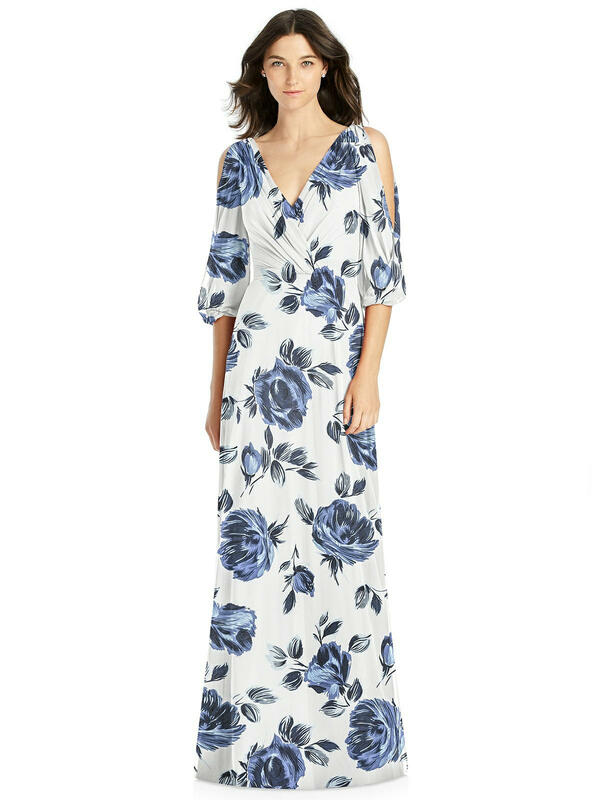 You can opt for big, splashy prints or delicate flowers, have your maids wear all different colors and even let them choose a unique dress style without compromising balance and structure. However, one thing we do recommend is that you keep your fabrics the same. Meaning, if you opt for pretty lux chiffon bridesmaid dresses for your solids, you should have the same fabric for your florals as well. 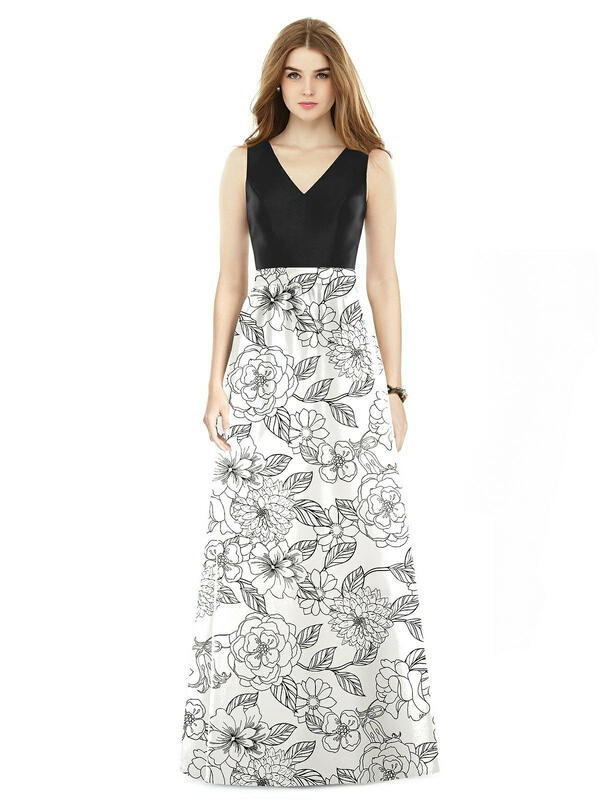 Fortunately, Dessy has plenty of floral and solid color options in a wide array of fabrics for you to choose from. You can easily browse our fabric swatches and order free samples to pin down the perfect fabric for your maids. Romantic, feminine and whimsical, floral bridesmaid dresses are the perfect choice for any spring or summer wedding. Although they're definitely on-trend at the moment, botanical prints have a timeless appeal that will never go out of style. When shopping for floral-accented bridesmaid dresses, remember to keep the usual considerations in mind, including your maids' budgets, their color preferences and the styles that are most flattering for them. With a little forethought, you'll please your entire bride tribe and have a stunning wedding to boot.